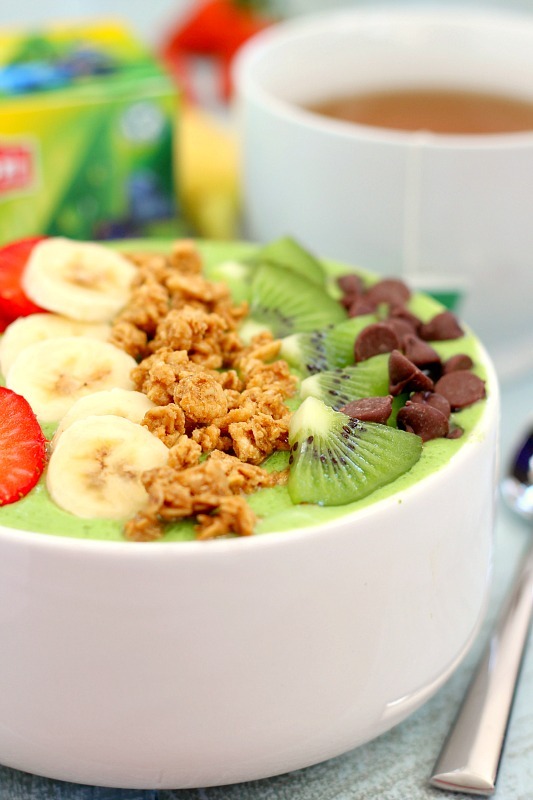 This Banana Kiwi Green Smoothie Bowl is the perfect way to jump start your mornings. Filled with bananas, kiwi, mango and spinach, this healthy bowl is packed with protein and nutrition. 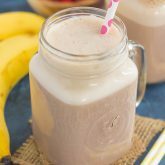 You can eat your morning smoothie and start out the day in a delicious way! Something strange has happened to me over the past few weeks. I’m still trying to wrap my head around this one. Ready for it? Let me explain a little better. Coffee and I go way back. Well, not waaay back, but I’ve been drinking it on a regular basis for the past eight years or so. And when I started to blog full-time last summer, that’s when my coffee cravings really kicked in. I would have a cup (or two) every day, and eagerly looked forward to it. I loved buying new flavors of coffee for my Keurig and trying the newest flavored coffee creamer. Cozying up with a steaming mug of joe was my happy time. But, over the past few weeks, that craving has diminished. I’ve still had some coffee here and there, but not every day, and I don’t crave it like I used to. Instead, I crave tea, and lots of it. And that’s strange to me, because although I’ve always liked tea, I would choose coffee over it any day. But not anymore. Now, I eagerly look forward to my morning cup of tea, as well as one at night to help me unwind. I’m chalking up this new change of drink to the fact that the weather is freezing here (it’s been in the negative temps lately) and that tea can really warm me up, with its robust flavor. It’s also a bit healthier than coffee, since I always add a lot of cream. Lipton Tea is my go-to drink of choice. With their green tea, along with the new black and herbal varieties, Lipton gives you a bold tea experience, filled with flavor. Their teas have renewed my love for this drink. If you like green tea, then you’ll love the light and fresh taste of Lipton, as well as the delicious aroma. Their Purple Acai Blueberry Tea is a favorite of mine. It’s refreshing and and uplifting with every sip you take! And along with Lipton’s green tea, their black and herbal varieties don’t disappoint. With bold flavors and real ingredients, this tea will awaken your senses and give you a new-found love for this special drink! So when I was sipping on a steaming mug of Lipton’s Purple Acai Blueberry Tea last week, I decided to make this Banana Kiwi Green Smoothie Bowl to go along with it. The combination makes the perfect power breakfast, which is just what I need to get me going in the mornings. I’ve made a smoothie bowl once before, and it was definitely time to do it again. I love “eating” my smoothie with a spoon. It’s more fun and more filling, especially with the fun toppings. It’s also a great way to get your daily dose of fruits and veggies. This Banana Kiwi Green Smoothie Bowl makes the most delicious breakfast. It contains a thick and creamy texture that will leave you full and satisfied all morning long. 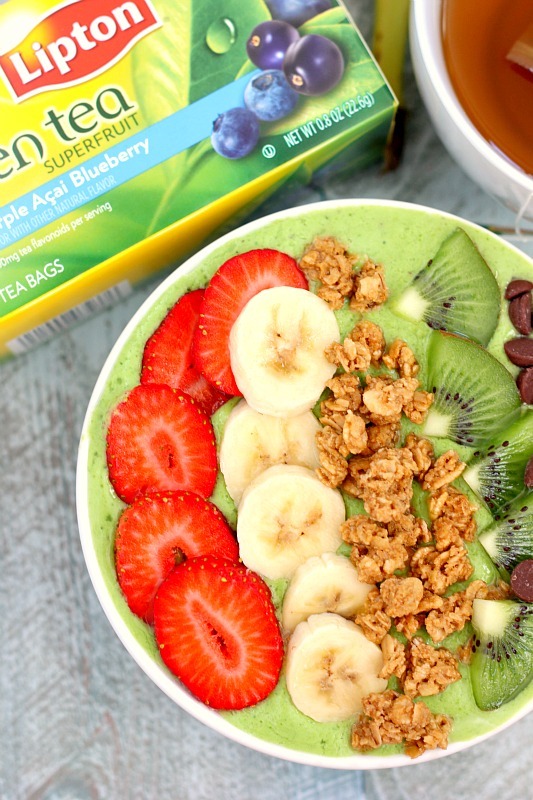 It also pairs perfectly with a variety of Lipton Tea, which means that this smoothie bowl and tea makes a powerhouse combo! Like most of my recipes, this smoothie bowl is a breeze to whip up. Simply combine some frozen banana slices, kiwi, frozen mango chunks, spinach, almond milk and Greek yogurt into a blender. Then, blend away until it reaches your desired consistency, and then pour into a bowl. Then comes the fun part: the toppings! I chose to top this smoothie bowl with some banana slices, kiwi, strawberries, and granola. But feel free to add on whatever you want! 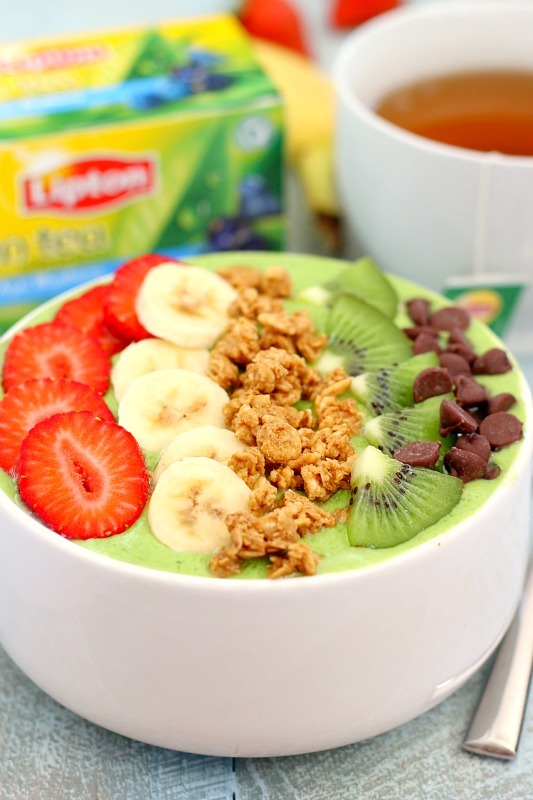 This Banana Kiwi Green Smoothie Bowl, along with a hot cup of Lipton Tea, makes a sweet and nutritious power breakfast to start out the day. Easy to whip and so full of flavor, you’ll be making this breakfast over and over again! 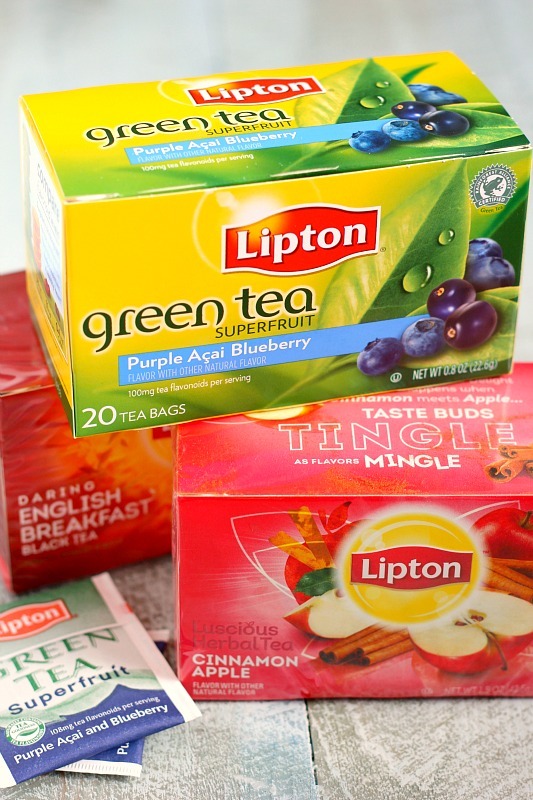 Be sure to check out the entire collection of Lipton Green, Black and Herbal tea flavors here! In the canister of a blender, combine the bananas, mango, kiwi, spinach, Greek yogurt, and almond milk. Blend until mixture reaches your desired consistency. Pour into a bowl and top with bananas, kiwi, strawberries, granola, or any of your favorite fruits. Seriously, I am loving on this smoothie bowl. I could eat one of these everyday forever and never be disappointed at all! This look so so so good! You nailed it! LOVE!!! Thanks for the kind words, Taylor! I'm on a total smoothie bowl kick right now! I've always preferred tea to coffee. So much more soothing! And with a smoothie bowl, you're giving yourself a much healthier source of long-lasting energy. This looks tremendous! Thanks, Mir! I've been drinking so much tea lately, and eating smoothie bowls, too! I have been drinking lots of coffee recently, so maybe I have found your lost love of coffee haha. This smoothie bowl looks beautiful Gayle. I have to share this on twitter! Haha you might have found my love for coffee, Dannii! :) Thanks so much for the kind words and share! Yes! I'm pretty sure I'll never grow out of smoothie bowls. Thanks, Megan! Haha it's SO weird! I still drink coffee and like it, just not ever single day. Thanks for the smoothie bowl love, Sarah! Haha whoa! I only lose my coffee craving when I have a cold, but even still I drink some to stave off that caffeine headache. I do like tea though, and usually drink a cup or two of an herbal variety throughout the day. Don't want to have TOO much caffeine. :) This smoothie bowl is beautiful! I've never made one but this makes me want to try! Haha isn't it weird?! I still drink coffee, but only a few times a week, as opposed to every day. I'm on a total tea kick now, and smoothie bowls, too! Thanks, Alyssa! I used to only drink tea because I hated coffee for the longest time! Within the last year I randomly became a coffee lover. Because of that, I haven't had tea in forever! I'm kind of craving a cup now :) This smoothie bowl is so creative, pretty, and looks delicious! I used to never drink tea but have started to love it in the past few years. So funny how tastes change! Thanks for the kind words, Keri! Oh wow, Gayle- the color of this smoothie bowl is intoxicating!! Love that vibrant green! And I really love the flavors you used! I haven't tried spinach in my smoothie or smoothie bowl yet and that definitely needs to change! Pinned! P.s that Lipton Purple Acai Blueberry Tea sounds like a delicious flavor, need to be on the look out for that! Cheers, friend! Thanks, Cheyanne!I love the color, too. I'm a huge fan of spinach in smoothies, you really can't taste it! Thanks for the kind words and pin, friend! oh my gawd, at first I thought you put tea into these smoothies!!!! What a gorgeous smoothie bowl, I love it!!!!! and I have to try the purple acai blueberry green tea, wow! what a great flavor!!! love this! Haha that would actually be a good idea, Alice! :) That tea is SO good! Thanks for the smoothie bowl love! Oh how clever! I love this smoothie bowl! I bet it pairs just perfectly with the tea! Beautiful photos Gayle! Thanks, Annie! This smoothie bowl goes so well with a hot cup of tea! I've had periods, when I just prefer tea over coffee, too! Love Lipton! This smoothie bowl looks fresh and delicious! Will try it soon! So glad you know what I'm going through with my love of coffee and tea! :) Thanks, Mira! Okay so I definitely still LOVE coffee, but I love this idea! 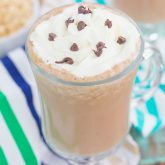 This is such a fun twist on a smoothie for breakfast! I don't think I'll give up coffee permanently, but I'm loving tea lately! Thanks for the smoothie love, Ashley! Can you believe that I've never had a smoothie bowl? Yours is so gorgeous and colorful that I clearly need to try it! Thank you, Rachelle! I think you would love smoothie bowls...they're so fun to eat with a spoon! Coffee will forever be my weakness, but I have started to love tea--a lot! This smoothie bowl is absolutely gorgeous! Thanks, Manali! I'm loving smoothie bowls too...so pretty and so fun to customize! I'm a coffee lover, but tea has a special place in my heart for sure. Smoothie bowls are the way to go, too, because you get to pile on the fixin's (my favorite part), and they're so darn pretty to look at, too. I love the flavors here and it's just gorgeous! Thank you, Marcie! I love the fun toppings, too...it gives the bowls such a great texture and flavor! I'm a huge coffee drinker but there was just one time I didn't have a taste for it...my first pregnancy... :) I'll tell you what though - hubby and I have been loving our tea in the evening before bed...so this smoothie bowl, fits right into our new scheme of things! Everything tea! The flavors are just so fun! I love having tea before bed, too! It really relaxes me. Thanks for the kind words, Annie! Gayle this smoothie sounds phenomenal! I love drinking smoothies after workout but never tried adding kiwi in my smoothie! Will totally try it this way! Thank you, Ami! The addition of kiwi is so good! I've thought about doing that because I know coffee isn't really good for you, especially since I add cream and sugar! Thanks for the smoothie love, Rachel! 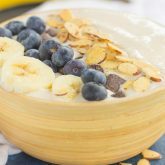 A big mug of tea and one of these smoothie bowls would definitely get my day off to a great start! I love the gorgeous colors in this bowl, Gayle! I still haven't made a smoothie bowl myself but I think that needs to change soon! Thanks for the kind words, Kristine! What?! Not having coffee every day?! Impressive. :) I like tea a lot too, though. It's actually one of my goals for the New Year -- drink at least one mug each day of tea. I want to try that apple cinnamon flavor. Delish! I love drinking tea, especially at night...it really relaxes me! And the apple cinnamon kind is so good! Thanks for the kind words and pin, Rachel! I have never been able to get used to the taste of coffee as a drink (although I do love it as an ingredient - go figure!) I'm a life-long tea-lover - I have a cup next to me right now! Welcome to the tea world! And love the looks of that delectable smoothie! I'm the opposite, I love coffee but don't really like it in desserts! But I am loving tea right now, too! Thanks for the kind words, Kate! This smoothie bowl is SOOO pretty!! I love all the toppings! Food is definitely more delicious when it's beautiful. :) I'm kind of a tea addict... I have at least 12 different boxes in my pantry at all times. Especially now since it's been so cold out! Thanks for the smoothie love, Jess! I love trying new flavors of tea, too! I've never made a green smoothie bowl but I'm loving the color and all the flavors going on here! Gorgeous! I love coffee but it sometimes I really get hyper from it. Tea has always been more calming for me. I drink it every day. 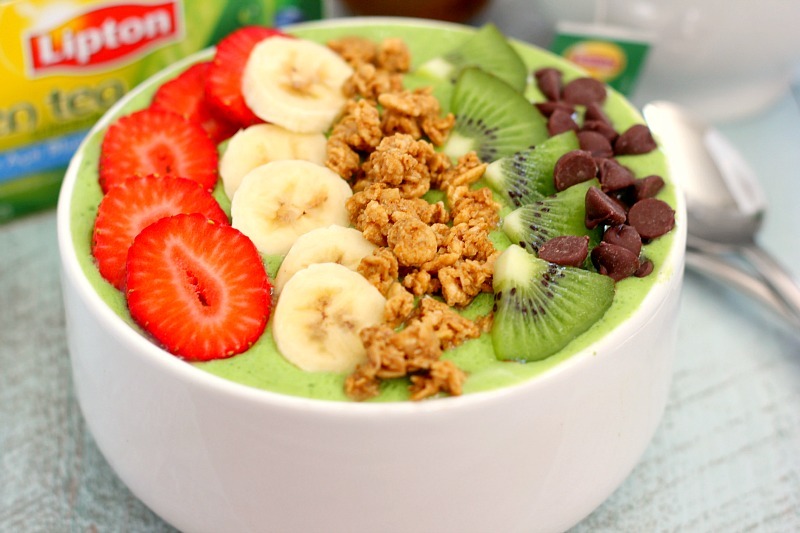 This smoothies bowl looks great! The kiwi and mango sound great with that spinach. I love finding ways to sneak in kiwi! Thank you, Amanda! I love finding new ways to use kiwi, too! I still haven't tried the whole smoothie bowl thing and I'm not sure why because they look amazing! I need to get on that! I think you would love smoothie bowls, Stacey! I totally crave both! haha I like my coffee and tea like mad!! 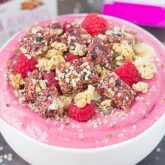 This smoothie bowl sounds fantastic - I really need to make the bowls more often ... I always just go for a normal smoothie! This is so pretty! I especially love the kiwi in there!! YUM! This looks amazing! I seriously need to make a smoothie bowl! They're just so beautiful! Also, I LOVE tea! I just drank some! I love to mix in a little almond milk to my hot tea! SO good! Oh I'm going to try adding almond milk to my tea next time! Thanks for the kind words, Cailee! My son and I have been having a smoothie every morning, why I havent tried a smoothie BOWL yet, is baffling. This looks incredible! All the good toppings on top, so good! Thanks for the kind words and for stopping by, Puja! I love the ingredients in this smoothie bowl. I'm all over that kiwi! Thanks, Jessica! I love the kiwi in here, too! I love how delicious AND healthy this is! Perfect way to start your day! I love my coffee and have one cup every morning. But if I need a little pick me up in the afternoon, I'll turn to tea. Lipton is the best and they have so many great flavors! This smoothie bowl is gorgeous, Gayle. I love snacking on pretty foods. All the colorful ingredients make it even more enticing! Maybe the smoothie bowl would convince my palette of tea's goodness lol! I've tried and tried and me and tea have just never gotten along. Time to give it another shot! Also, smoothie bowls are the bomb. They're so pretty yet so so healthy! Nailed it Gayle! It took me a looong time to like tea, Mary Frances! Just within the past few years actually! Thanks for the smoothie bowl love! Those tea flavors sound really good Gayle! And this smoothie bowl looks like such a healthy way to start the day!